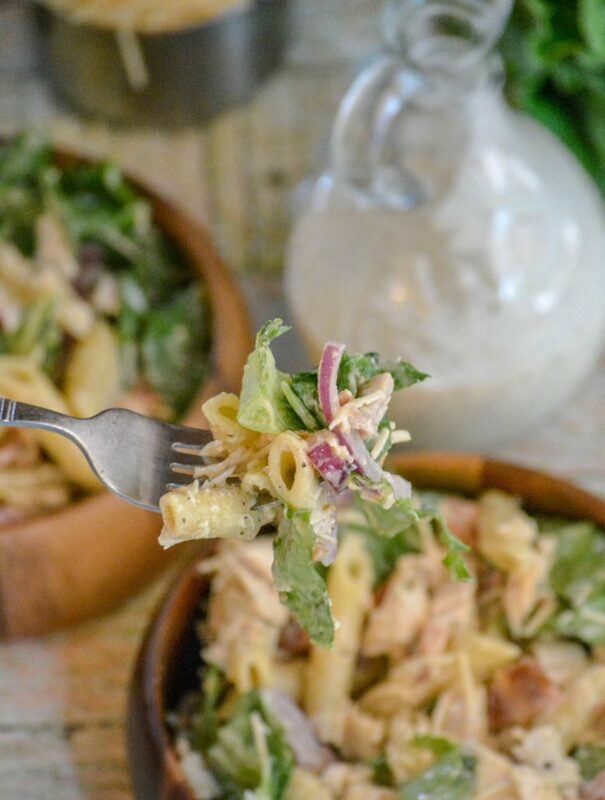 Who knew you could combine your favorite side salad with a a bit of pasta, and make a bit of kitchen magic like this Chicken Caesar Pasta Salad. It’s quick, easy, and so darn tasty. It’s a perfect family supper side dish, or an equally yummy lighter meal option. Sometimes, I think my kids must find me a real drag. I mean, they love carbohydrates sooooo much. Why should they be forced to suffer through a salad? If they were meant to eat leaves, they would have been born cows… right? No, but kuddos to the older ones for trying that argument on for size one night at the supper table. I’ll give them mad points for creativity and thoughtfulness. Really they don’t complain. Much. Only on days that end in ‘y’. I’m still kidding. They’re generally pretty good about eating whatever I put on their plates, with only the occasional groan or protest at the abundance of ‘healthy’ stuffs. However, this mean, green Mama came equipped with a wonderful little sensor. On any given day, at any given time, I can feel that resistance building. When I feel an attack of the ‘anti-leaf’ campaign approaching, I immediately resort to subterfuge. There’s a reason I’m smarter than them, at least for the time being at this point in their lives. So- I find a way to get those greens in. I get behind their defenses and hit them where it hurts. Right in the taste buds. 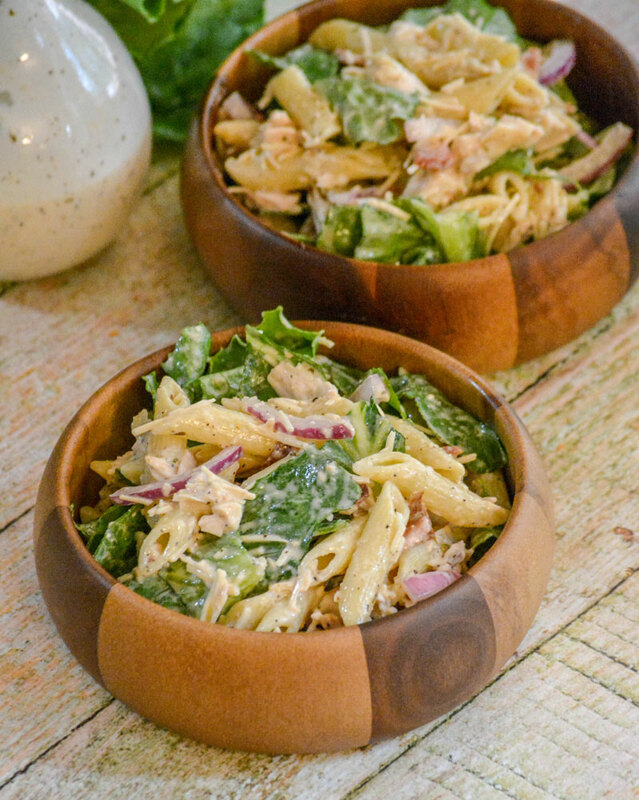 This Chicken Caesar Pasta Salad recipe is a beautiful pairing of pasta and salad that they can’t resist. The secret ingredient? Bacon! They see the greens, they know they’re good for them. They know they should at least try to resist, but their surrender is inevitable. This dish is just too tasty. 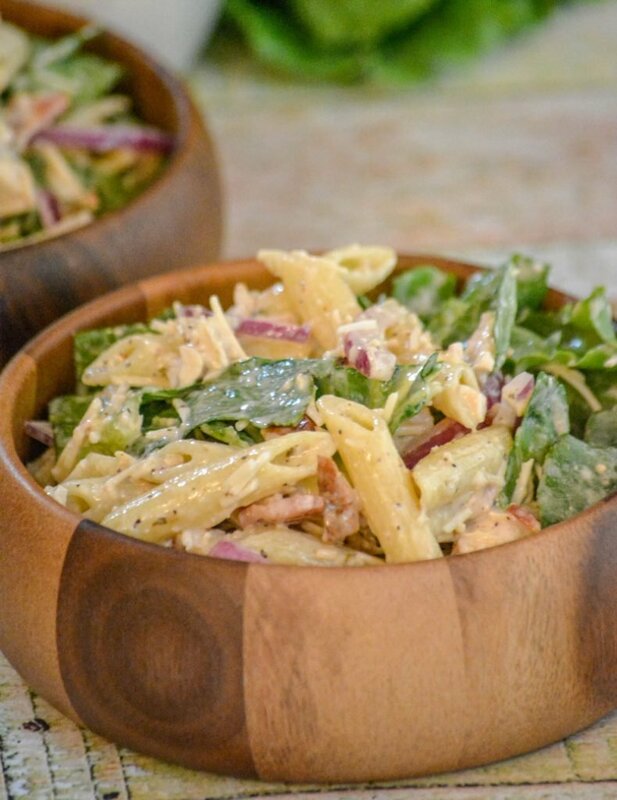 Support your own troops with this delicious pasta salad. Pack a punch that they won’t soon forget. Who said your greens had to taste ‘green’ anyway?! Certainly not anyone I’ve known or ever met. You? Din’t think so. Get creative, and get. them. in. Those growing bellies (and minds) will totally thank you- one day, at least. The pasta is cooked, and cooled under running water to stop the cooking. It’s then tossed with a tablespoon of the bacon drippings. Some people might balk at that instructions, but it’s more than a mere suggestion- it really does make all the difference in flavor, and it keeps the noodles from sticking together. I highly recommend you adhere to this step when making this dish, despite the extra calories. You can use whatever version of Caesar dressing you fancy most. Whether it’s store bought, or homemade. 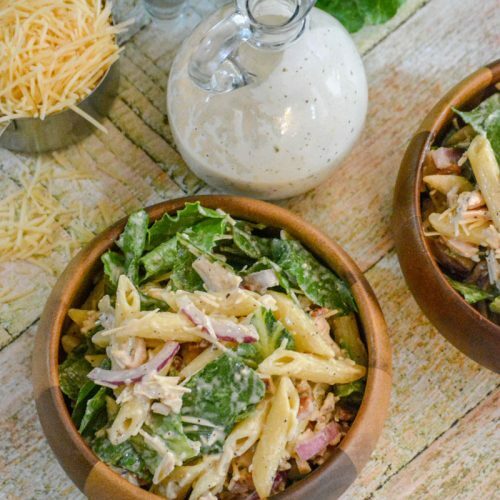 If looking for a homemade option, I highly suggest our Easy Homemade Caesar Dressing. If you opt for store bought, just use a creamy version and not a vinaigrette. You need the creamy to stick to all the ingredients and keep them together, a vinaigrette is thinner and won’t work as a ‘glue’. Simply put, it will run, not coat your salad’s ingredients. Lastly, as with any dish that includes a leafy element- you can make this ahead of time, but unless you want soggy wilted lettuce leaves in your dish- don’t actually stir in the lettuce until just before you’re ready to serve. 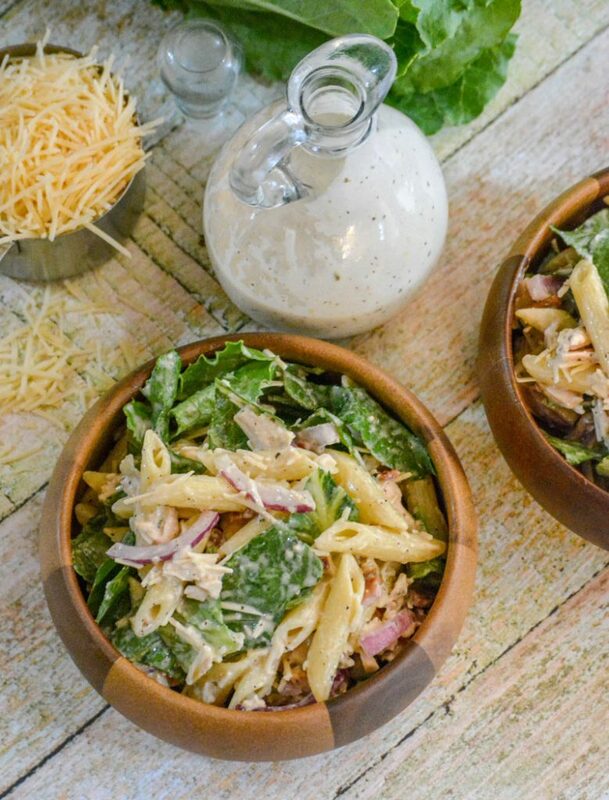 We don’t serve this as a chilled pasta salad, but it tastes good that way too. If you’d prefer it cold, simply make as instructed (skipping the lettuce until serving time), and chill, covered, in the refrigerator for 3-4 hours before needed. 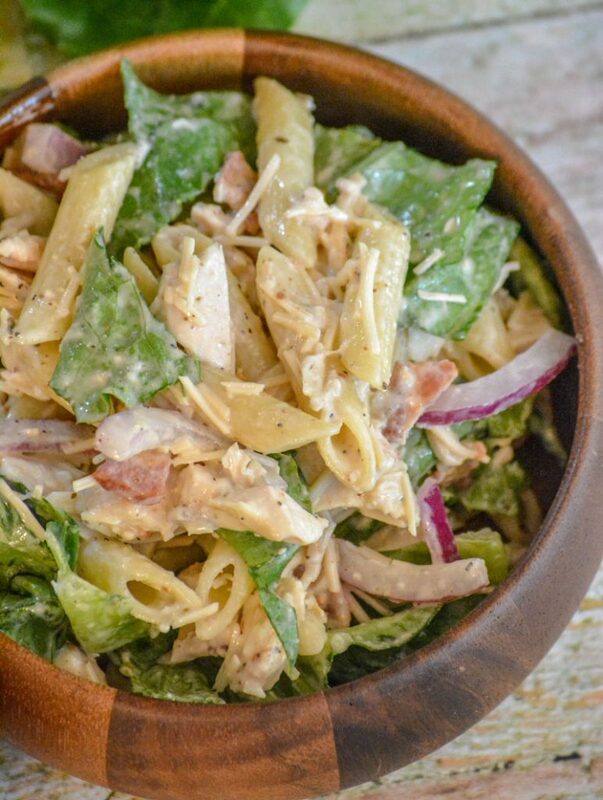 A healthy chicken Caesar salad meets a refreshing, creamy pasta side dish in this Chicken Caesar Pasta Salad. 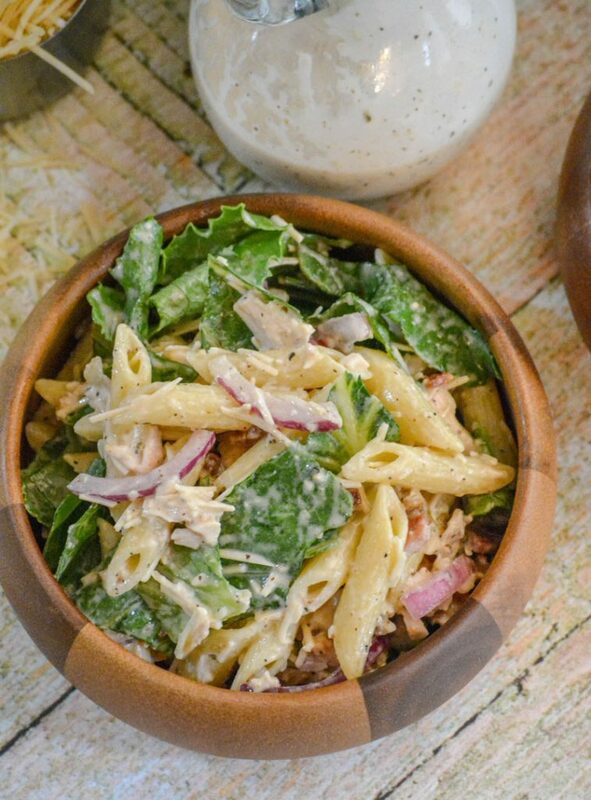 It’s loaded with penne pasta noodles, crisp green leaf lettuce, crumbled bacon, tangry red onions, and chopped rotisserie chicken- all lightly bathed in a creamy Caesar dressing. Salted & peppered to perfection, it’s a perfect filling side or light, filling meal. 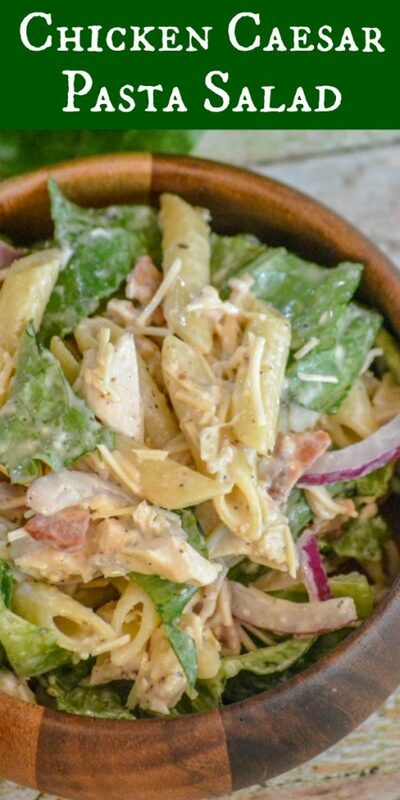 Other Quick & Easy Pasta Salad Recipes You Might Also Enjoy: Creamy Italian Chicken & Asiago Pasta Salad, Crunchy Doritos Taco Pasta Salad, Pizza Pasta Salad, & Sesame Ginger Pasta Salad. 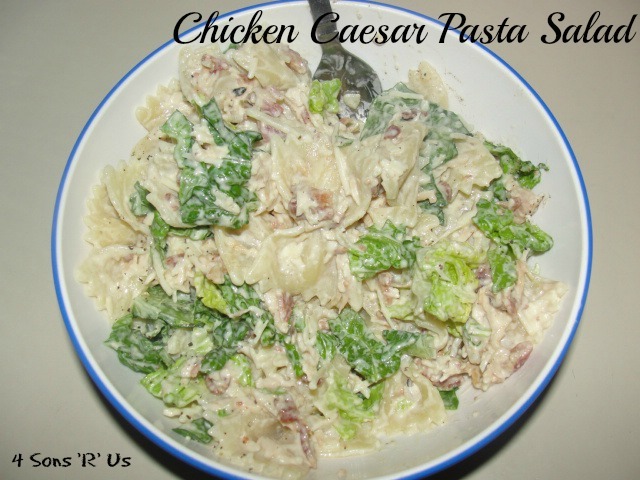 A quick and easy side, this yummy hybrid combines your favorite classic Caesar salad with a yummy pasta dish. Cook pasta according to package directions. Drain, run under cold water to stop cooking, and set aside. Cook bacon, reserving 1 tbsp of the grease/drippings. Transfer cooled pasta to a bowl and toss with the bacon drippings* until evenly combined. Add in all other ingredients and stir thoroughly until evenly combined. Add in more dressing if necessary, to taste, and again toss everything to evenly coat. *Don’t skip the bacon drippnigs! I know it might be tempting, but the flavor just isn’t nearly as robust without it. Also, it helps prevent the pasta from sticking together if you want to let it chill or transport. **If not serving immediately, DO NOT add in the lettuce until you are ready to serve. If you add in the lettuce and don’t serve immediately the lettuce will be wilted and soggy. This look SO good – and who could resist that bacony goodness? I bet coating the pasta with the bacon drippings adds the perfect extra pop. I bet this would be good with salmon as well. Thank you for sharing at #FiestaFriday! All that’s missing is egg, otherwise great recipe!